James Broughton's short film This Is It, based on a poem he wrote, is apparently inspired by Zen Buddhism, something which is entirely appropriate of a movie surely designed to test even the most restrained of patience. Like a juvenile and infinitely less talented Terrence Malick, Broughton attempts to craft a film which finds human's place in the divine and in the ordinary at the same time suggesting that, perhaps, there is no difference between the two. It goes without saying that Broughton's film is nowhere near as aesthetically or philosophically expansive as the immaculate works of the great director of The Tree of Life. A voice-over, reciting the poem which gives the film it's title, lets us know (on multiple occasions) that: "This is all there is, and it's perfect as it is". 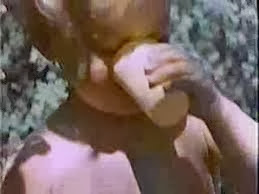 Whilst this phrase and similar iterations are incanted repeatedly, Broughton shows us home video footage of a naked child chasing after a ball and playing in nature. It's not hard to think, of a film which at ten minutes feels triple the running time it had any right to be, that a more appropriate name for the feature would be "Is This It"?